Well folks, there goes April - another month in the life of the KawaiiPunk Blog gone! But what a month it was! A month in which we got to see a child-like Junior Mascot, found out that Greeks were better than Romans, and even solved the mystery of alien abduction! And along the way we also got to see the fantastic work of Pipapiep, Flyk, and Monstar Clothing, to name but a few! And, as ever, we also got a monthly puzzle from our very own Puzzle Mascot! 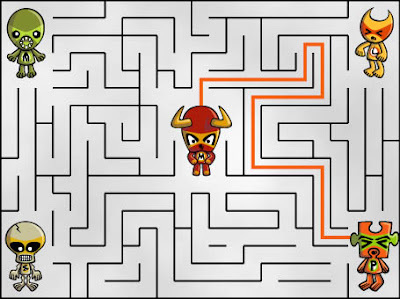 Did you work out who helped the Minotaur Mascot escape? Amazing! It was none other than the Puzzle Mascot himself! Who’d of thought the mascot that set the puzzle, would turn out to be the one that solved it! Simply incredible! Just how on earth are we going to top that revelation? Well… come back next month folks and you might just find out, because the word on the street is that next month’s blog is going to be even more action packed than ever! There’s even a rumour of a birthday party on the cards! I know, it is intriguing, isn’t it?